A Mysterious Waffle: When life gives you lemons, make Lemon Drizzle Cake! When life gives you lemons, make Lemon Drizzle Cake! 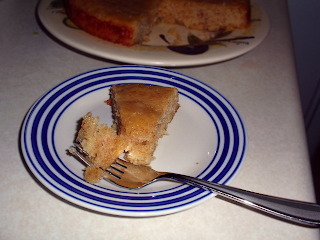 I'd been promising Rob a lemon cake since his birthday, and I found some yummy Meyer lemons at Whole Foods. I decided that Jamie Oliver's Lemon Drizzle Cake recipe would be a nice choice, and after perusing the recipe, Rob approved. However, I didn't have any poppy seeds, self-rising flour or an 8" spring form pan, all of which were called for in the recipe. I decided to nix the poppy seeds, and use my 9" spring form pan and hope for the best. The internet also informed me that I could substitute 1 cup of self rising flour with 1 cup of all-purpose flour, 1/2 teaspoon salt and 1 1/2 teaspoons baking powder. The results were a delicious treat that was thoroughly enjoyed by Rob and even me, despite my less than enthusiastic opinion of things lemon flavored. 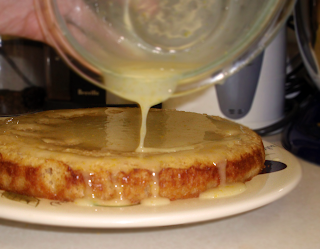 Figure 1: Drizzling the lemon glaze over the cake. Mike and I went to a cupcake shop in State College last night where they had lemon cupcakes with cream cheese icing and filled with lemon curd. They were amazing, as I'm sure this was too! mmmm, cream cheese frosting rules. i may have to add carrot cake on my list of things to make in the near future . . .